In 2015, National Epilepsy Week ran from 17 to 23 May. We worked with with our Stay smart theme which aimed to encourage people with epilepsy to manage their risk. During that week we highlighted some ways in which people can keep track of their epilepsy, and talk to their doctor or epilepsy nurse about the health risks of having epilepsy. The campaign was part of our Call for Openness Campaign. We asked people to support the campaing by inviting someone with epilepsy to sign up for EpSMon (which was not available at the time). 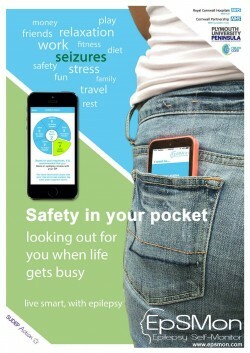 EpSMon is a smartphone app designed for use by adults who experience seizures. The National guidelines encourage people with epilepsy to attend regular reviews with their GP, but this may only be once in a year. EpSMon is intended to help people keep track of their epilepsy, monitor their risk in between hospital appointments, understand SUDEP and factors which may affect their risk in order to help them decide whether to seek help or not. There are more than 600, 000 people with epilepsy in the UK, with 87 people diagnosed with the condition every day. Epilepsy claims at least 1,200 lives in the UK every year, at least 600 of these are Sudden Unexpected Death in Epilepsy (SUDEP). Research shows that about 42% of these deaths are preventable through better management of known risk factors. The SUDEP and Seizure Safety Checklist is a tool aimed at health professionals. It is designed to track and monitor change of risk factors in people with epilepsy. The tool is easy to use and can be completed quickly in clinic by doctors and patients. The checklist is based on evidence of risk factors for Sudden Unexpected Death in Epilepsy, and includes the major risk factors known to be associated with fatality in epilepsy. EpSMon uses evidence based on work completed for the SUDEP and Seizure Safety Checklist as part of the Epilepsy Life Project. We asked supporters to use the below template letters to get involved in the Stay Smart Campaign for National Epilepsy Week. They had the option to personalise the letters as long as the main information stayed the same. We made the EpSMon leaflet & poster available for download below for those who wished to send them out with the letter. Supporters were encouraged to let us know how they would get involved in campaigning by contacting samantha.ashby@sudep.org. They were also invited to contact juliet.tumeo@sudep.org if they required a press release for their local papers.